Some of the finest .308 ammo you can buy. This is a stone cold ½ MOA accuracy rifle load from the proper guns under normal conditions. It is an obvious choice for use in any tactical shooting scenario where absolute accuracy is king. Speaking of Kings, this load features the A-MAX MATCH projectile in 168 grains, which is about as direct a competitor as there exists for the Sierra Match King Boat tail projectile. This A-MAX features a polymer tip for numerous reasons, not the least of which is the improved ballistic coefficient. The increased deformation on impact of this projectile will also help it compete with the Sierra Match King as the risk for over penetration is lessened at shorter ranges. The Hornady manufacturing plants offer some of the tightest production quality control protocols in the world too, meaning that the projectile isn’t the only precision-made component. 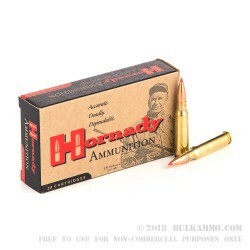 Hornady ammunition is perennially a performer across the board for its entire portfolio. 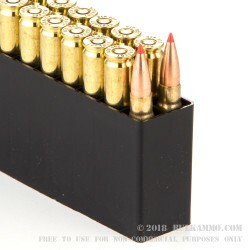 This is a .308 Winchester round that offers a 168 grain projectile that will achieve sub 1/2MOA routinely with the right equipment and shooting experience, and can offer 2700 feet per second velocity at the barrel exit and 2719 ft. lbs. of energy. Did exactly what I wanted it to.